Glamorgan captain Jacques Rudolph remains hopeful his side can pull off a massive run chase even without him on the final day against Kent. Kent's batsman all contributed as the home side built a strong lead to take control. Rudolph fell for 14 as Glamorgan reached 32 for 1 in their search for an improbable victory target of 404. "It's still a very good wicket and I'm bitterly disappointed that I got out," said Rudolph. "This game has shown that if you do get through the new ball it becomes considerably easier so I think we definitely feel we have a chance to win this game." 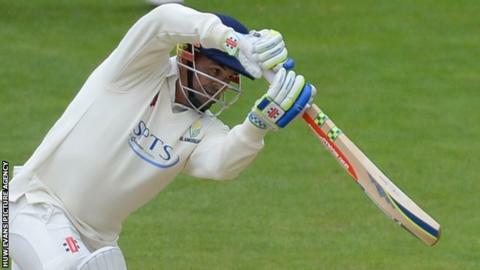 Glamorgan have already topped the 400 mark twice this season, but both those efforts came in the first innings of the matches against Leicestershire and Surrey. Rudolph believes the scoring rate of nearly four runs an over should not be an obstacle with runs coming at a good rate through the match so far. "Hopefully we can have a good start and then put some pressure on in the afternoon. "William Bragg played really well in the first innings (making 104) and hopefully he can continue his form while Colin Ingram is very hungry to score runs so hopefully we can get into the final session." But Rudolph is warning his bowlers their performances need to improve in future games to back up the efforts of fast bowler Michael Hogan. "We are not 100 percent on the button yet," he said. "We need to take a long hard look at ourselves. "It's difficult to maintain games when every over or second over there's a four-ball and you need to pull the game back." Rudolph also had time for a word of sympathy for former England batsman Kevin Pietersen, a contemporary from their early playing days in South Africa. Pietersen will not be considered for England this summer after director of cricket Andrew Strauss said there was a "massive trust issue" between the two. "I think he's been a little bit misled, they said that if he goes back into county cricket and scores runs they will consider him again and he averages 212 for the season with a career best of 355," Rudolph said. "I think he will be bitterly disappointed they didn't select him. "I don't know if it's the end of the chapter for him but hopefully if he keeps scoring runs, at some point they will pick him. "He's a great player but for that to work again, they need to settle their differences from both sides, get onto the same page and try and get England cricket back to where it belongs." Pietersen made 19 and 53 not out in his comeback for Surrey against Glamorgan in the Championship IN aPRIL but is not due to feature in their opening T20 Blast meeting.